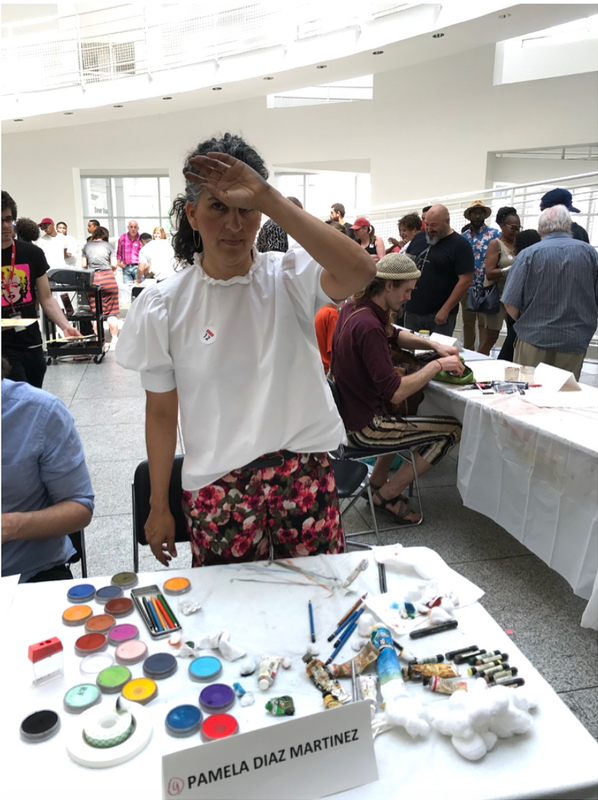 Every two years or so, The High Museum of Art hosts the Monster Drawing Rally. Approximately, 75 artists are asked to participate. There are 3 - 1 hour shifts, the artists choose the shift they want to draw in. The artist can make as much art as they wish and then it is given for sale to raise funds for the museum. All works of art are $75. Its a great way to start a collection on a budget. Thanks to all of the people who purchased my pieces, support artists and came to the event. Paddle8 and The Museum of Contemporary Art, Georgia other wise known as MOCA GA make a great pair. They work together to create an opportunity for artists and art collectors to acquire a wider audience while creating an experience for their current clientele. They are featuring one of my pieces for the first time. Below is a statement from the museum about the auction. "The auction features a diverse and elite selection of artwork of Georgia artists who have exhibited at MOCA GA. The online auction is accompanied by a two-week museum exhibition on view in the MOCA GA's lower level Education/Research Center. Fast, easy bidding with Paddle8 Auctions makes it easy to keep tabs on your favorite works of art throughout the auction." Thanks to Marc Leone Art Associate Professor at Northern Kentucky University in the School of The Arts, The Holy Spirit and I are on Youtube for the first time. This endeavor started out as an interview with his drawing and painting students. As a class they studied my erasings, made some erasings of their own and then formulated very thoughtful questions to ask me via facetime. Thankfully, that conversation turned into a Youtube opportunity. Marc Leone does incredibly detailed drawing tutorials on his channel that has over 6,000 followers. Its title is The Drawing Database and just recently he has begun to feature artist interviews. 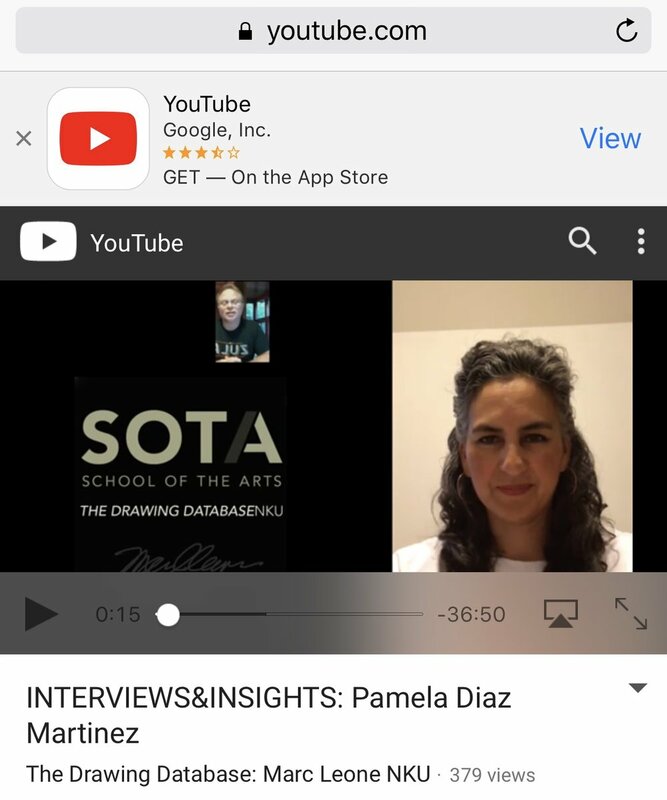 If you have a little extra time and want to dig into the academic side of the art world, there are many tutorials and interviews to enjoy. Let's do it again Marc. Click on the picture to see the interview. Gathered III: Georgia Artists Selecting Georgia Artists, on view through July 1, brings together the work of 36 artists selected from more than 356 entries. 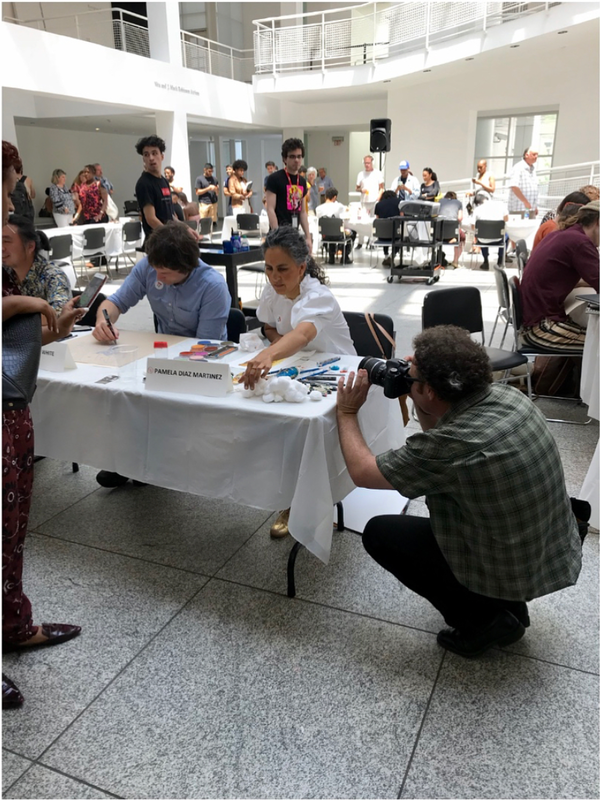 The jurors — painter Rocio Rodriguez, actor and mixed-media artist Masud Olufani and photographer Jerry Siegel — elected to show more work by fewer artists for this year’s biennial juried exhibition, a laudable decision that makes for a richer experience. For comparison, 60 artists were part of the inaugural 2013 exhibition and 77 in the 2015 show. Gathered III opens with colorful abstraction. Like much of the paintings in the exhibition, Maurice Clifford’s commanding Art and Marriage/for Jeff/for Judith (2008) is non-figurative. Its meandering composition consists of frenzied patterns of condensed, gestural oil paint. It benefits from its large size and horizontal format, suggesting vastness and change over time in a way that a smaller composition would not. Evocative of post-painterly abstraction, nearby Maggie Davis’s The Garden (2016) and Ailwee (2015-16) consist of striations of bright acrylic. Carla Contreras’s Jungle (2017) functions similarly, using various media — nylon tights, clay, thread, yarn, wire, acrylic and light — to transform a section of the gallery from generic white space into a room-size sculptural installation. Alexander Caulder seems to be an obvious influence, but the work is softer and more organically chaotic. Though markedly different, the three artists showcased here seem to respond to 20th-century abstraction to produce bright, nonobjective work. 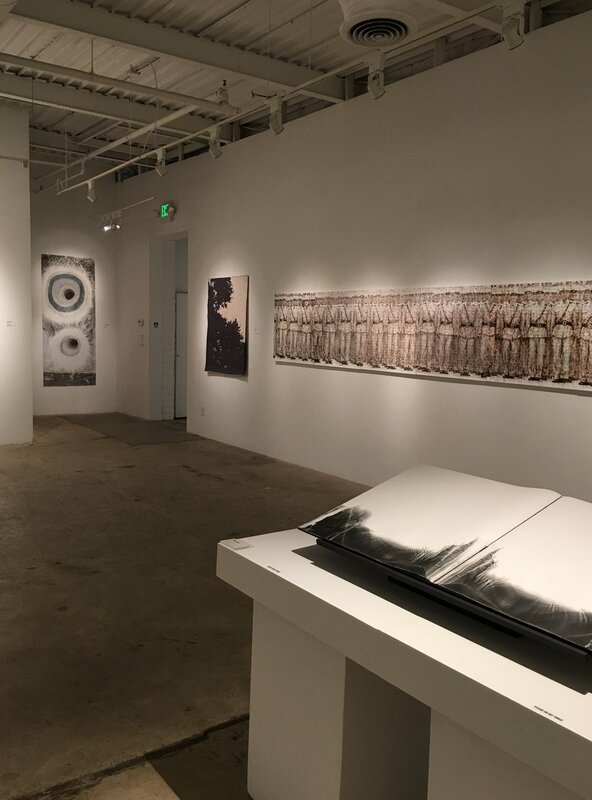 The proximity of Clifford, Davis and Contreras evidences one of the strengths of Gathered III — the curators’ ability to organize seemingly unrelated work in a meaningful way. Consistently, the curators deal with the problem of many disparate works in a single show by aligning works that share aesthetic or thematic qualities, creating subtle formal and content-driven groupings. As is indicated by the curator’s grouping of Clifford, Davis and Contreras at the outset of the show, colorful abstract and nonobjective painting is robust. Corrine Colarusso, Terri Dilling and Stacie Rose are exemplars. Yet, the Juror’s Prizes went largely to artists who used a limited palette or black-and-white, and only one painter. Working in grayscale, Betsy Cain earned a Juror’s Prize for her oil on Yupo paper works, Drip Head # 1 and Moss-Heads #2, 3, 4, and 5. The simple figures, softly rendered silhouettes, make oil paint look like more aqueous media such as ink or watercolor. Traditional drawing has a weaker representation throughout the exhibition. Using a medium historically considered part of painting, Pamela Diaz Martinez uses graphic techniques for her pair of vertical pastel works. Observed and Recorded Permutation of the Holy Spirit XI (2015) employs hatch marks and erasures to created a feathery pattern in warm colors. Similarly, Observed and Recorded Permutation of the Holy Spirit X (2015) evokes the supernatural, showing a pair of vortex-like motifs above a low horizon. Her usage of abstract pattern and ascendant composition appropriately conveys her immaterial subject matter. Contrasted by Maria Artemis’s nearby bold, charcoal-heavy Large Dark Series 6 (2016) and Flow (2017), Margaret Schumacher’s graphite works on paper stand out as subtle explorations of smoky, abstracted chiaroscuro. Schumacher’s One on One (2016), for example, is both delicate and visceral, evoking both the landscape and close-up depictions of scratched and scarred flesh. Textiles have a strong presence in Gathered III. Lyn Montagne’s Oak at Dusk # 2 (2016) and Oak at Dusk # 4 (2017) are dyed and woven linen wall hangings that show the silhouette of leafy trees in a restrained palette. Junco Sato Pollack’s Kinhin Series #5 Nirvana (2016) is a nonobjective collage of dyed polyester organza and taffeta. Metallic thread creates patterns of opalescent stitched lines and grids. While Montagne and Pollack utilize more conventional processes, other makers push the medium into a more sculptural arena. Sonya Yong James won a Jurors’ Prize for her works. Strong in both form and content, Nothing Gold Can Stay shows a gradient of wool felt and horsehair that moves from pale ivory to chocolate brown, so as to suggest the passage of time and decay. Dread-like tendrils made of dyed wool felt and cotton accumulate in dense layers in Entanglement. James’ hirsute wall pieces have an easy resonance with Juror’s Prize winner Amy Landesberg’s nearby Plasti Plast (2017), a kinetic sculpture made of a series of gently rocking sculptures inspired by Samuel Beckett’s play Rockaby. A series of white semicircles contain found wire and fibrous material and suggest nascent plant life. The sculpture’s subtle characteristics might get lost at a crowded opening; it’s worthwhile to visit the gallery on a quiet afternoon to hear the soft, irregular sounds — almost like footsteps — of the swaying, cradle-like forms. Though there’s not a lot of sculpture and installation work, they command a lot of presence, often due to their scale. Standing over 10 feet tall, Michael Murrell’s Skull Tower (2014) has a totemic presence. Claire Chambliss’s Would You Love Me If… (2017) uses paper blinds, pipe cleaners, glitter and diamond dust to form a diagonal, cascading form. Nearby, Imi Hwangbo’s small, intricately cut Slyph II (2010) plays off of the large, pleated forms of Chambliss’s large installations — one of the many clever curatorial moments of the exhibition. Stand-out sculptures of a less grandiose scale include Lillian Blade’s Remembrance, a simple but effective assemblage of brass frames, and Ann Stewart’s small, intricate nylon Big Bang Baby (2015) and Sui Generis (2015). Suggestive of narrative, Donté Hayes’ Time Capsule (2016) is a mixed-media work that utilizes an old Coca-Cola crate and test tubes. Though well crafted, it lacks contextual information that would add clarity — namely, what’s in the test tubes. Gathered III encompasses a healthy range of photographic practices. Mary Anne Mitchell, Joshua McGowan and Carmen Rice use or incorporate analog processes to create figurative imagery. Mitchell prints scans of original wet plate collodion photographs. The enigmatic Hair the Maiden Fair (2016) features a masked man and woman in a field. Even stranger, Hidden Seeker (2016) shows a wraith-like figure behind a tree adjacent to a child’s backyard playground. Mitchell effectively exploits the soft blur of the 19th-century process to create spectral and satisfyingly nightmarish pictures. Yet, she flirts with a hackneyed and theatrical goth aesthetic — going a little darker might benefit her. McGowan won a Juror’s Prize for his new take on old methods: photographic exposures Study 6-5-7-4 (2016) and Study 5-1-6-2-7 (2016). Both were made with a device designed to expose multiple large negatives simultaneously. The sizeable black-and-white portraits evade sharp focus so as to create nuanced and ethereal studies of single figures. (Full disclosure: McGowan was a student in my classes at Piedmont College.) Rice’s Worst Enemy, Best Friend (2017) consists of 25 manipulated Polaroids showing a woman at work in her studio. India ink and epoxy resin mark and obscure the images, as if to emphasize their physicality. Laura Noel, Lucinda Bunnen and Spencer Sloan utilize digital methods to create bright abstractions. Noel’s Color Crescent (2017) and Divided Dagger (2017) show a classical Greco-Roman sculpture of a woman augmented by bright overlays of pink, blue and violet. Bunnen’s Reeds in the Water (2015) and Boats Floating (2015) seem to be an extenuation of the artist’s Weathered Chrome series of digital reproductions of aged slides that are transformed into brilliant fields of color interrupted by nebulous expanses of white where the flimsy material deteriorates. Sloan’s Kendall Jenner Leaving a Dinner Party in Beverly Hills 5/15/15 (2017) impresses with its large scale (over six feet tall) and scrambled pixels. Sloan corrupts a paparazzi image into a complexly abstracted picture in which the original referent — the celebrity identified in the title — is no longer visible. There is an odd correspondence between Bunnen and Sloan: both destroy source material and seem concerned with the relationship of images and media to perception and memory. Despite the strengths of Gathered III, the relative dearth of digital media of this kind and the total absence of video is a weakness. Jong-Kwang Hyun, Maggie Evans and Jon Field have the most explicitly politicized content. Painted in confident, translucent layers so that bare canvas and graphite grid lines show through, Hyun’s Soldiers in Uniform (2015-16) stretches to an impressive 20 feet. The rows of men seem to repeat infinitely as if to de-emphasize their humanity. Evans’ Collective Amnesia (2014) shows apartment buildings in monotonous rows and ominous grisaille from an aerial perspective. Evans’ Target (2015) depicts a similar cityscape at a closer angle, its foreboding overtones amplified. Field’s Victory! (2016) is made of countless steel dressmaker pins inset in velvet. The impressively stippled image shows James Franco’s character in the 2014 The Interview, a film that rose to prominence due to Columbia Picture’s postponement of the release after threats from North Korea. Field’s sparkling surface plays off of adjacent work by Caomin Xie: simple but beautiful evocations of the cosmos titled Gold Mountain (2016) and Occupy the Void (2015). Yet, Field’s use of velvet has a jocularly critical feel, suggesting the vintage appeal of lowbrow kitsch reborn. His combination with sewer’s tools suggests a thoughtful revision of medium hierarchy. Field’s act of appropriation seems to suggest artificiality — that is, the notion that the controversy surrounding the film was media hype that resulted in the critically feeble film’s box-office success. Interestingly, these works don’t seem particularly aimed at current events, and Gathered III generally skirts overt sociopolitical commentary — a surprise, given our current cultural climate. Ultimately, there is a conservative tone to Gathered III in both its approach to media and content. This could be a reflection of either the jurors’ tastes or the makeup of the submissions; my intuition is that it’s the latter. 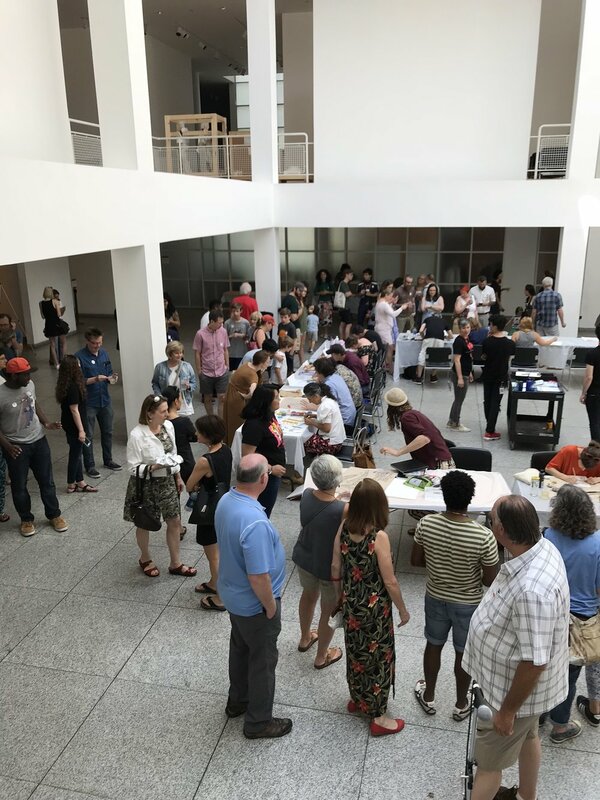 Saturday, May 13th, The Museum of Contemporary Art, Georgia otherwise known as MOCA GA, presented works of art by 36 artists all across Georgia. To get the process started MOCA GA selected 3 of their veteran artists to curate a show. 350+ artists submitted 5 images in an online platform, 2 of my pieces were chosen. 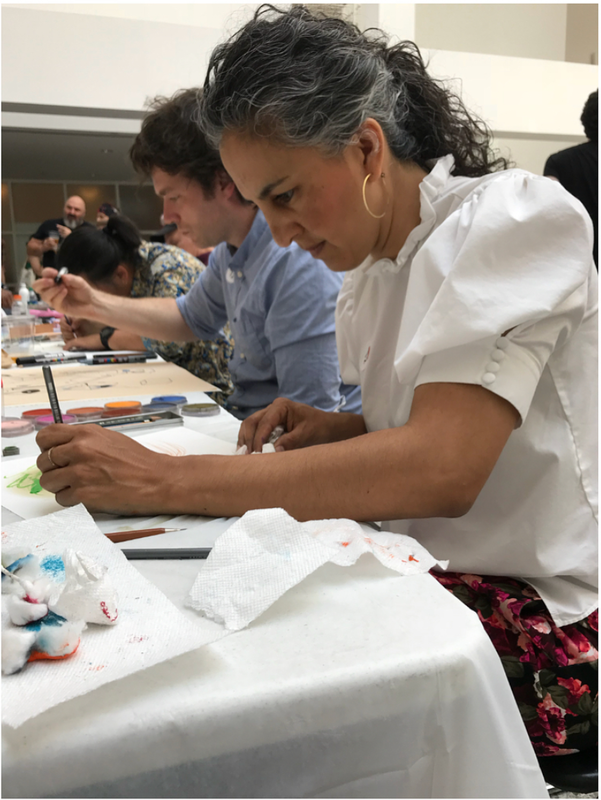 (Just a quick thank you to Jurors: Jerry Siegal, Rocio Rodriquez and Masud Olufani, Director Annette Cone-Skelton) This is the third time that the museum has asked artists to curate a show of other artists. They chose less artists so that they could feature more of their work. Jerry Siegal, a photographer by trade, said that, "they all picked work they liked separately and then they came together as a group to curate the show." "Gathered 3", the title of the show, is a feast for the eyes and mind. There are so many distinctive artistic expressions. Get out and see some art!